Vegans, people who are lactose intolerant and those allergic to the dairy protein casein can enjoy baked treats that call for cow's milk by replacing it with almond milk, which can be purchased or made fresh at home. Almond milk is gluten-free and offers an alternative to soy milk, a common substitute for cow's milk that can also trigger allergies. Though it can be used in savory dishes, almond milk works best in desserts. Almond milk can be used in cakes, breads, muffins and other baked goods. 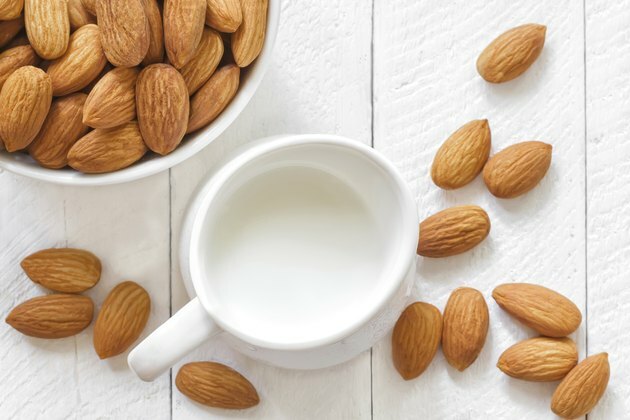 Replacing dairy with almond milk is easy because there is no need to adjust the quantity. Simply replace the amount of cow's milk the recipe calls for with an equal amount of almond milk. The substitution can affect the baking time, so you may need to remove your dish from the oven a few minutes earlier than the recipe indicates. If you want to use almond milk in a baked custard or pudding or another recipe that is expected to be thick, add a few extra tablespoons of a thickening agent, whether it be flour or cornstarch. Almond milk is sold commercially in a number of flavors. There are plain, chocolate and vanilla varieties, as well as unsweetened almond milk for consumers who do not want to add additional sugar to their recipes. Though it has a slight nutty flavor, plain almond milk will not significantly alter the taste or color of your baked products. Baking with almond milk does not mean forgoing vitamins and minerals. Almond milk contains nutrients including iron, potassium, magnesium, zinc, phosphorous and vitamin E. It also provides some protein, though not as much as cow's milk. Moreover, almond milk has no cholesterol or saturated fats, which makes it healthy for the heart. It is also lower in calories than both cow's milk and soy milk, making it preferable for people who wish to lose weight. People with tree nut allergies, however, should not consume baked products made with almond milk. While you can find pre-made almond milk in many grocery stores, you can control the ingredients by making it yourself at home. Start by soaking raw almonds in water overnight. Subsequently, drain the almonds and puree them in a blender with water. Push the pureed mixture through a cheese cloth, nut milk bag or a very fine strainer to remove any remaining solid nut particles. Add flavor by blending your almond milk with vanilla extract or honey. When using the milk in baking, limit your use of sweeteners -- you don't want to over-sweeten your recipe.